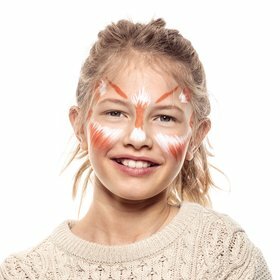 Take your white Brush Pen and paint the base for your fox face. 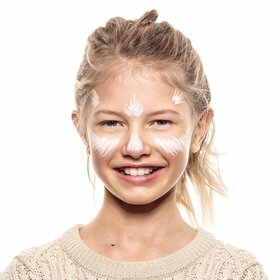 Use quick, short strokes under the eyes, on the nose and around the forehead. The Brush Pen’s clever nib will help make short work of this. Now get your orange Brush Pen ready, as it’s time to add some colour. Enhance the white strokes you’ve already painted with similar orange strokes at the ends to create a fox fur effect. 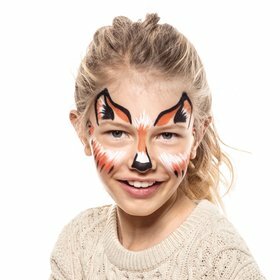 Now finish off your design with your black Brush Pen, adding detail to bring out your fox nose, ears and whiskers. Painting outlines and fine details is easy with Snazaroo Brush Pens, so it’s fun to finesse a fab fox with fine flourishes. Fantastic! Hankering for Halloween ghouls and ghosts? 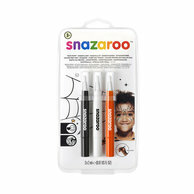 It’s frighteningly easy using the black, white and orange paints in the Snazaroo Halloween Brush Pen Pack.